Bar anchors typically consist of three main components: the bond length, the un-bonded length and the anchorage head. The bonded section of the anchor is developed in competent rock or soil and the load is therefore transferred into the underlying formation. Subsurface conditions determine the drilling medium which can range from air, water, or grout with spoils being flushed from the bored hole to the surface. Solid bar anchors are more often used in soils that are not as likely to collapse, and in rock. 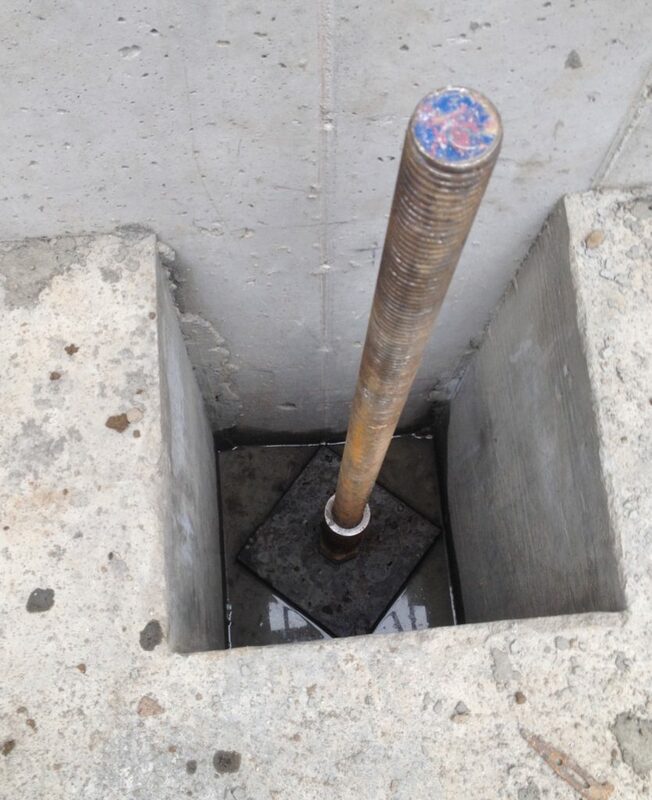 This technique may utilize temporary casing to advance the borehole total depth into which the bar anchor is inserted. The borehole is then filled with grout and the casing withdrawn to create the anchor. Hollow bar anchors implement a relatively simple technique where the borehole is advanced with a sacrificial drill bit utilizing a hollow stemmed reinforcing bar as the actual drill rod. Once the bit has reached total depth, grout is injected through the hollow stem bar and creates the anchor. This simple, single-step process is most often utilized in challenging soils that are prone to collapse. Geotechnical construction covers a vast array of anchor applications including simple bar anchors in practically limitless applications. Bar anchors come in a wide variety of types, products, and designs. The drill hole diameter and bond length are key elements in determining the anchor characteristics and capacity. Bar anchors can be used to tieback retaining walls, stabilize slopes and rock walls, or increase the stability of dams or other large structures. The CDE team of engineers, technicians and anchor specialists work hand in hand each day to determine the best bar anchor application for the job and proudly exceed the expectations of our customers.